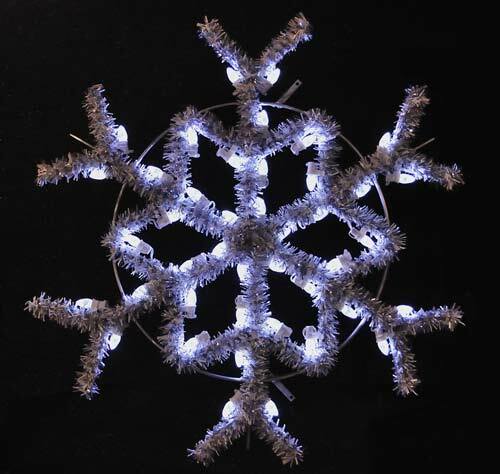 Versatile 3 feet hanging snowflake featuring pure white C7 LED lights. These snowflakes are some of our customer favorites as they work well with many other decor and add a festive touch to your outdoor lighting display all season long. Size is 3 feet wide by 3 feet high and weighs approx. 7 lbs. Designed to hang , these 3 feet garland and LED light snowflakes add just the right festive touch to your winter holiday season display. Designed to hang, these 3 feet garland and LED light snowflakes add just the right festive touch to your winter holiday season display. Try mixing these blue snowflakes with pure white ones for a more dynamic display! Designed to hang , these 4 feet garland and LED light snowflakes add just the right festive touch to your winter holiday season display. Perfect for mixing with different snowflake sizes and colors for a fun visual twist! Designed to hang , these 4 feet garland and LED light snowflakes add just the right festive touch to your winter holiday season display.